Sometimes my job can feel materialistic and wasteful — I’m constantly buying, buying, buying…and oh yeah, did I mention? Buying! We all search for some kind of meaning from our careers (or else how do we have the drive to follow them? ), and I’ve chatted with many a fellow designer recently about how to bring more purpose to our work beyond designing for beauty, function, mental wellbeing, etc. We keep coming back to buying more locally – to supporting the independent makers, brands, and shop owners that make up our city’s thriving creative community. But if you’re not, say, a designer with a rolodex of local makers at your fingertips (do those even exist anymore? ), shopping “small” can be tougher than you think. It takes time and effort to seek out those companies, and those of us chasing kids or juggling work might not know where to even start! 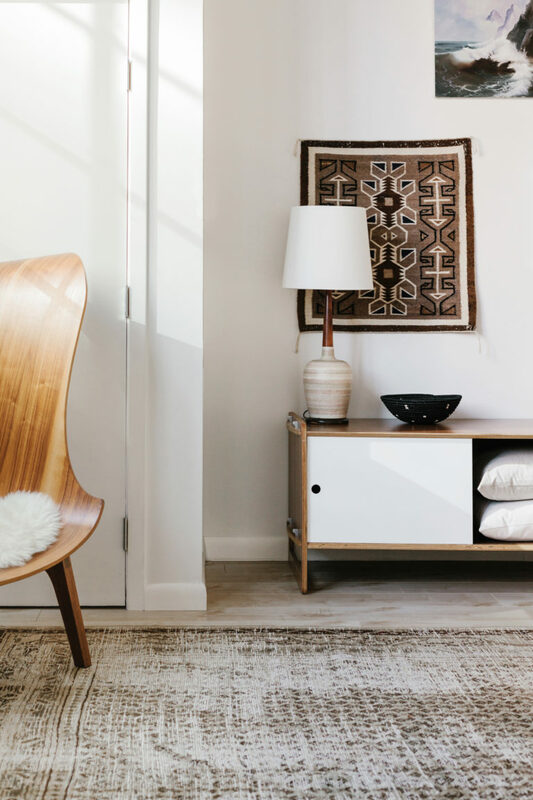 So, what if there was a one-stop shop for local, modern design? Where you could find everything and everyone all in one place? Enter Guest House, a new furniture and home goods retail concept that creates shoppable pop-up homes using local and small-biz products. 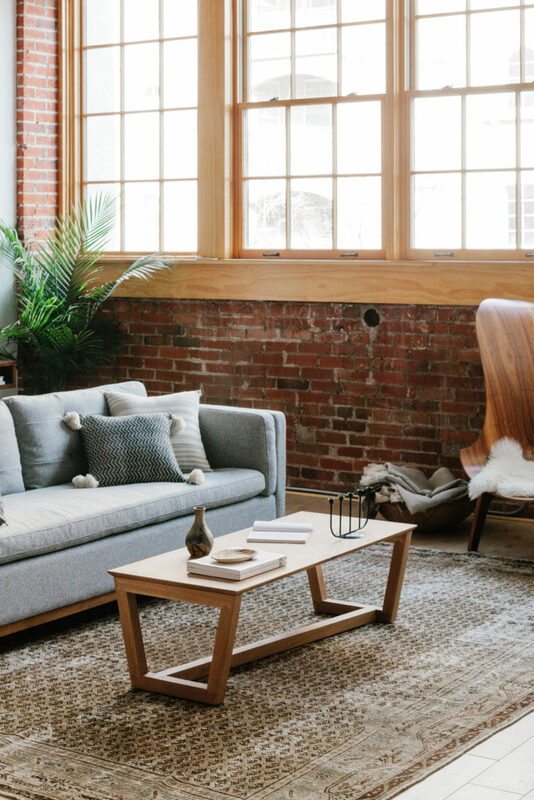 I recently partnered with them to make over a modern, industrial loft in downtown Denver and not only got to stretch my designer wings a bit (industrial is not exactly my wheelhouse), but also discover some truly unique furniture and home decor companies I never knew existed. Alex, the founder of Guest House, had reached out to me at the end of last year about possibly working together and my immediate reaction had been a big fat YES OF COURSE but I was still not quite prepared for the crazy whirlwind that was the two (!!) weeks I had to pull this together! I normally spend months on a space, but here I found myself at the beginning of January with a blank canvas and a looming deadline. No client but myself to run decisions by and no budget per se, but limited to local pieces if I could find them and in-stock product only. I’m still a little amazed at the speed at which this came together, and am so grateful to all the brands who tolerated my late-night, back-and-forth emailing and made multiple trips to the space to drop off or pick up their goods. It was a CRAZY rush designing at high-speed and when I say it wouldn’t have been possible without these amazing companies, I mean it. The space before: great light, cool brick, ho-hum kitchen. 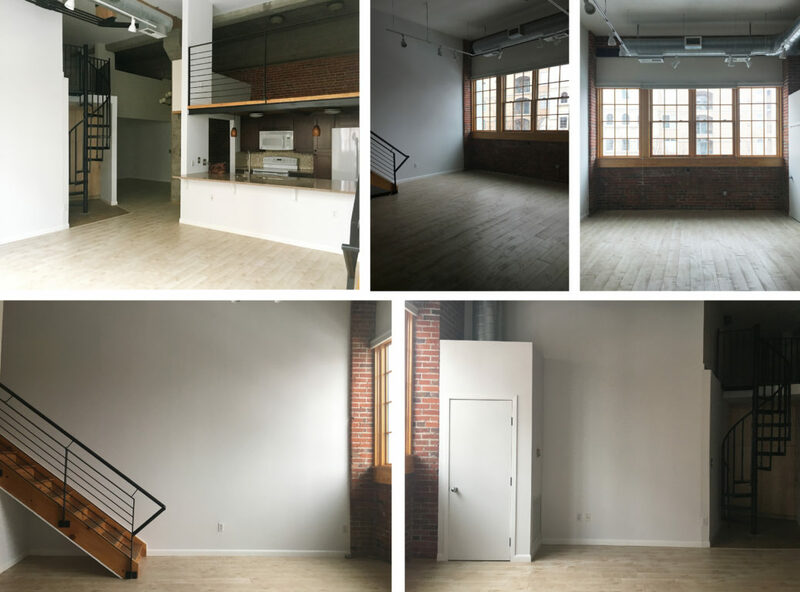 If you’re sitting there wondering ‘why the mad dash, Anna?’, it’s because this space was about to go on the market (through Slate Real Estate Advisors). In addition to being a retail company, Guest House is also a staging one. 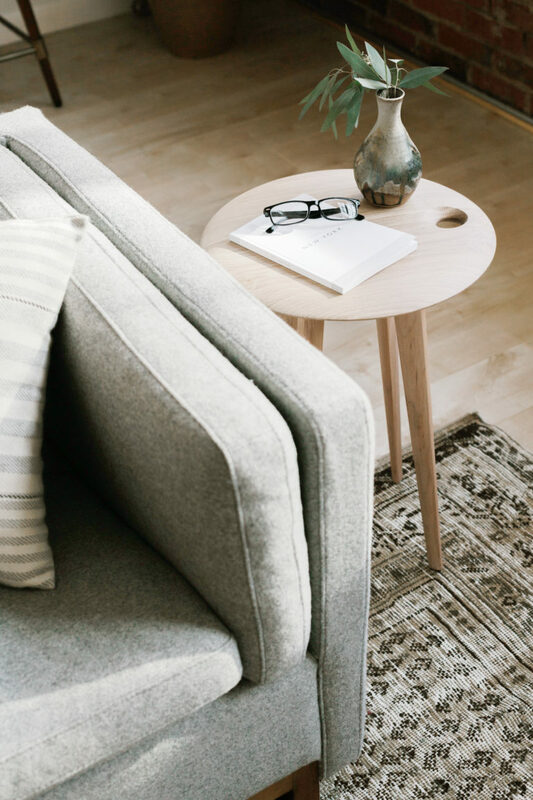 That’s what makes their shopping experience so much fun — you can see everything as it would be in a real home, and not only lounge on that beautiful sofa but test drive the mattress and take the dining chairs for a spin. So, limited as I was I knew I wanted to cozy up the place as much as possible. Industrial spaces need that balance, something to counteract all the concrete and hard lines and this loft was no exception. We needed warmth and comfort with a modern bent, a color palette that didn’t compete with the existing finishes, and design that walked the line between masculine and feminine — we were selling the space too, remember! Although the design was like a giant puzzle and I had to piece together what I could based on what was available, having a defined color palette of blues, grays, and warm woods from the get-go really helped curate the loft in a way that felt intentional and collected. 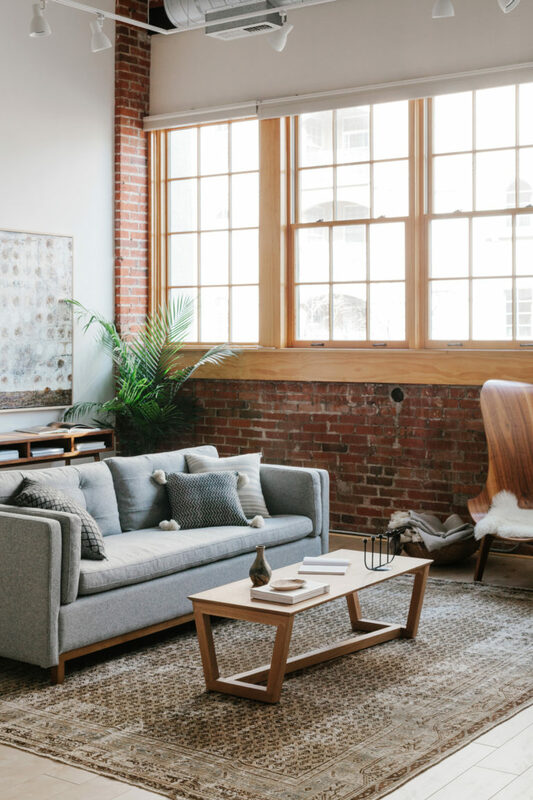 The living room is the heart of this loft, what with those amazing windows and super high ceilings. There are so many rockstars in this room, but what really grounds the space is that Arlo sofa from Sixpenny Home. Sixpenny is a newer online retailer (they just reached the year mark – congrats guys!) that offers super affordable furniture with a definite industrial vibe, with some mid-century pieces mixed in as well. 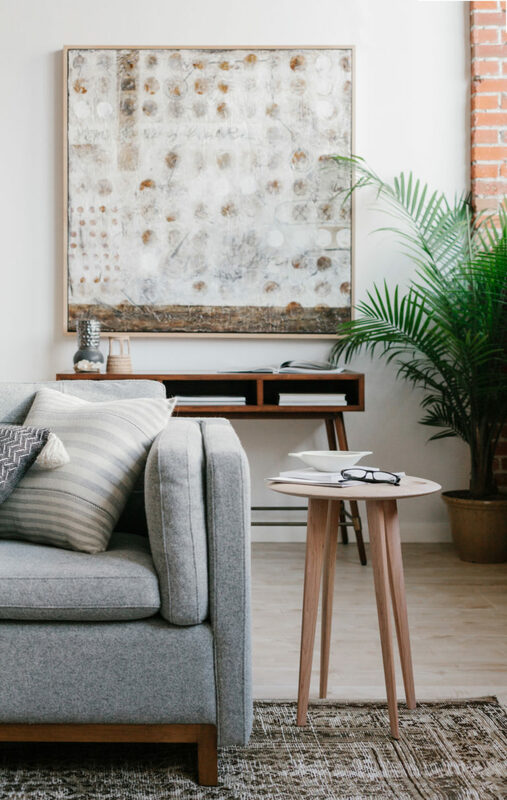 The cool gray wool of this sofa acts as the perfect counterpoint to that warm red brick, and it’s so soft! I love the tufting on the back and the side cushions, too. Although Sixpenny is an online store its founders, Jon and Kevin, are based in Boulder and it’s been so awesome getting to know them better! That console is theirs too (you’ll see more of it in a minute) but you should really check out their entire collection. What’s more, you can get 10% off your order with code GUESTHOUSE18. I also love this piece by Kristen Abbott who is a local painter I connected with last year on Instagram (she bought some pillows from me when I was Marie Kondo-ing our house! Have you guys read that? It’s life changing). Besides being a lovely person, she is also super talented and incorporates so much texture into her art as well as things like old postcards and letters. That wall was crying out for a large, statement piece of art and this piece definitely delivered! I’m a big believer in mixing woods, which you can tell by these photos! But the days of matching are looooong gone friends. 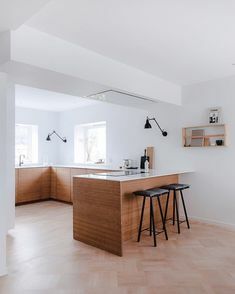 That’s why I’m digging this side table — I’m a sucker for that beautiful light white oak, and the legs are actually cherry. It’s subtle but oh-so-pretty. This vase is from one of my all-time favorite vintage stores, run by Kelly Meeks. She has an amazing eye and I totally ransacked her shop for this project – thanks Kelly!! 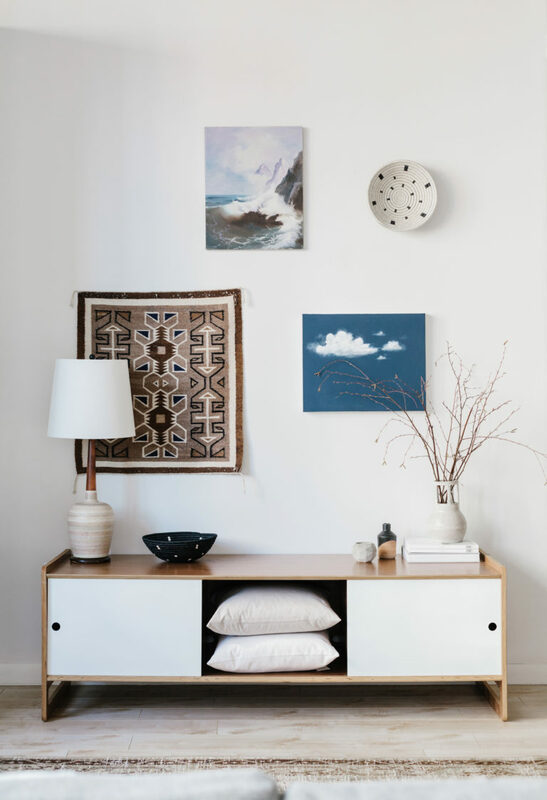 Opposite the sofa is this cool credenza (it ships flat!) which I styled with more beautiful local ceramics, vintage goods, and original art. If you lived here, this is probably where you’d put your TV — but wouldn’t this be so much nicer to look at every day???. I’m not a huge gallery wall person to be honest, but I must say I do love this one. The trick to making yours interesting is using texture, and making sure all your pieces “talk” to one another. 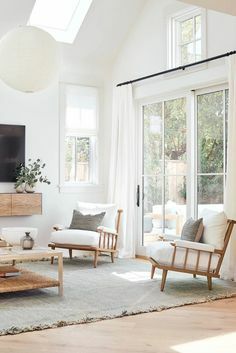 That vintage rug and hanging basket add dimension and echo each other’s pattern (geometric) and palette (black/white) while the fluffy white clouds of the lower painting echo the foamy waves of the seascape. See? There’s a whole conversation going on! Also did I mention that seascape is a STEAL!!! And if no one grabs it that gorgeous vase might have to come home with me. Speaking of vases, I can’t get enough of these ceramics by potter Molly Berger. Her glazes are so pretty (that black one is metallic) and the cut-out profiles are just cool! What really made a difference in this living room was this vintage rug from Old New House. I always feel that vintage ANYTHING gives a room soul – it tells a story in a way that newer pieces can’t. 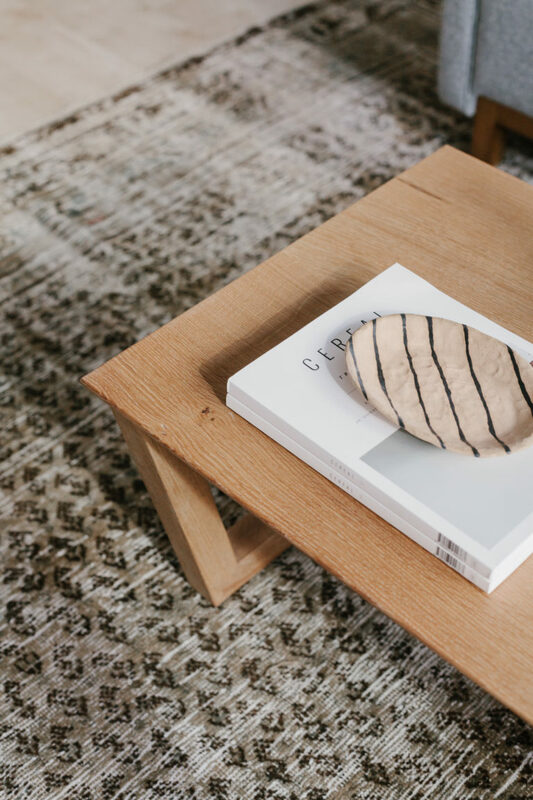 Melissa and Dave are based in New York, and I love using their pieces for clients and can’t wait to get my hands on one of their rugs for my own home. This one is a perfect warm neutral – busy enough to hide dirt and stains from kids or pets, but with such amazing wear! There are so many “vintage-look” rugs out there now but at the end of the day you can’t beat the real deal. I love this shot so much. That coffee table and chair are a dream. I seriously want to live here! Sadly, I can’t – but YOU can shop the space in person or online, and be sure to follow along on Instagram for open hours and events, as well as keeping an eye out for our next space! A giant, heartfelt thank you goes out to all the artists, brands, makers, and companies who came together to create this space. It truly was a collaboration and one I am so proud to have been a part of! I’ve met so many talented individuals in the past two weeks that I would never had had the pleasure to meet if it hadn’t been for Alex and the unique vision that is Guest House. (I also had so much fun working with Brandon, who shot this space for us and did such a beautiful job! 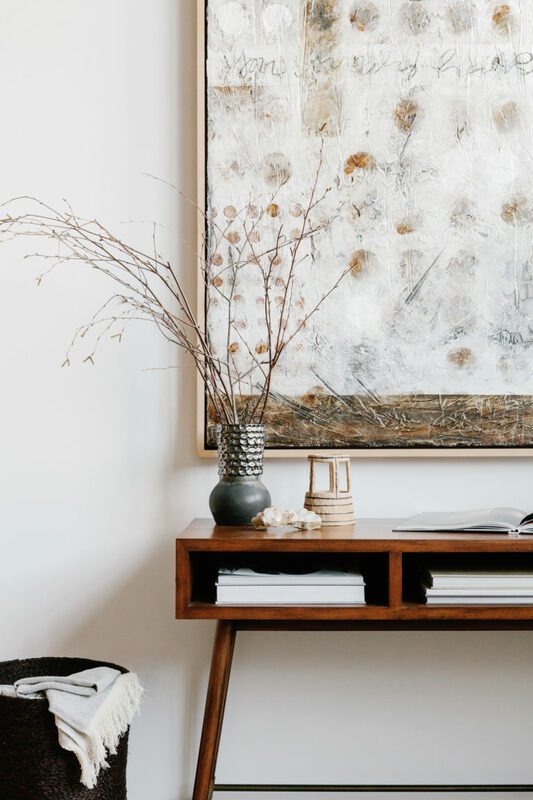 If you’re looking for an interiors photographer, I can’t recommend him enough — he totally anticipated all my styling tweaks and was finishing my sentences by the end of our shoots.) Even though it was fast-paced and stressful at times, I’ve left this project feeling so inspired and can’t wait to incorporate these products into my client work here in Denver. I’ll be sharing the loft’s bedroom, dining room, and entry verrrry soon and I can’t wait — until then, I’d love to hear what you think about this concept and what else we could do to make local art and design more accessible! I loved the clean crisp style in your decorating, Anna, and most especially loved the art piece by Kristen Abbot. I feel that the colors, texture and sheer size of the piece pulled everything together in the photos that displayed her art in your post. I think the beauty and Unique thing about your interior design is that you scout out and showcase local artists. Keep up the wonderful work!